The Consultants - 15 minute sketch shows that are brilliant. Episode 3 of season 1 is available at the moment. Apparently they made 4 series. See how much more subtle I am than Debbie and Dom! The 'Future is a Foreign Country' anthology is now available for preorder from Random Static Press. 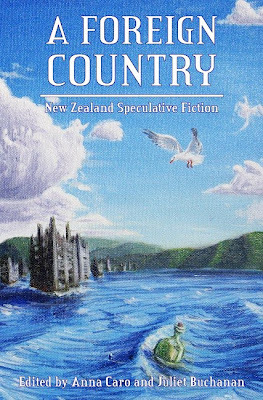 It's got short stories from a whole bunch of kiwi writers including Anna Caro, Matt Cowens (that's me! ), Dale Elvy, J.C. Hart, Tim Jones, Ripley Patton, Simon Petrie and many others whose names I am not yet familiar with. The anthology is being released at Au Contraire, so they're expecting it to be in stock around August 2010.